Newsreports state that a 41-year-old Wyoming man has survived an encounter with a grizzly bear in which he was twice mauled but still managed to ride on horseback to rescuers. The man reportedly was hunting in the morning with two others in the Teton Wilderness in northwest Wyoming when a sow with two cubs attacked him. Sheriff’s office stated that the man heard the brush rustling right next to him and the next thing he knew the bear was attacking him. He reportedly suffered severe lacerations on his head and bite marks on his back and rear hip area and was taken to Eastern Idaho Regional Medical Center in Idaho Falls for treatment. The other hunters were not hurt. The place, Wyoming is a state in the mountain region of the western United States. The state is the tenth largest by area, the least populous and the second least densely populated state in the country. The 5th annual Wyoming Women’s Antelope hunt is set to take place October 12 through the 15 at the Ranch at Ucross. The Wyoming Women’s Antelope Hunt was founded in 2013 by the Wyoming Women’s Foundation as a opportunity for mentoring and developing camaraderie between women. Hunting is a long-standing Wyoming tradition ! and a skill that honours state’s cultural roots, states their website. How tough is that hunting an unarmed timid antelope – shooting them with a gun, that too in pairs ! – who will tell the mankind that their perceived valour is loss of life for a little creature. There are deaths – some man made, and some otherwise – there are some cataclysmic events that result in ecological chaos, which the modern World has no no idea how they’re impacting the environment.” This post is about ‘mass die-off’, a terrible tragedy that sparked a worldwide search for answers, some more outlandish than others – aliens were mentioned on social media a few times. It is all about - Saiga, with their strange elephant like probosces used to filter dust, have already been all but wiped off the map by poachers keen to cash in on their valuable horns which sell at £2 a gram on the Far East medicine markets. The horns are powdered down and used to make a cooling drink said to bring down fevers. For the saiga, persecution by hunters has seen their global population reduced by 95 per cent in less than 25 years, a catastrophic decline accelerated by the fall of the Soviet Union and the opening up of previously closed borders. This decline has now reached crisis point after the sudden and inexplicable mass die off that occurred a couple of years ago ! 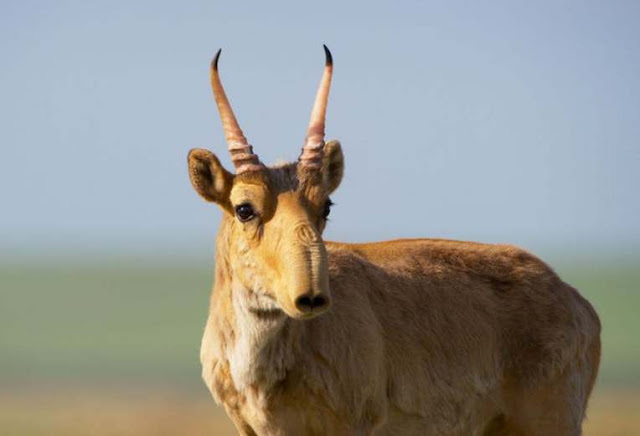 The saiga antelope (Saiga tatarica) is a critically endangered antelope that originally inhabited a vast area of the Eurasian steppezone from the foothills of the Carpathian Mountains and Caucasus into Dzungaria and Mongolia. On the remote steppes of central Kazakhstan, a truly extraordinary – and tragic – event unfolded in May 2015. Female saigas gathered in huge numbers to give birth on the open plain over a period of just 10 days – and a BBC camera crew and the research team they were with watched them die in their hundreds of thousands in the space of just a fortnight. The animals wre captured in an episode of BBC nature documentary Planet Earth II. But why did this mass death happen? By gathering like this, for as short a time as possible, the saigas swamp their main predator, wolves, with food so that each individual calf is less likely to be eaten. The calves are born large and well-developed – in fact, saigas have the largest proportional birth weight of any wild ungulate – so that they can outrun a predator within just a few days. They also need to give birth in a short time in order to coincide with the peak of lush grass before the summer heat of this harsh continental plain dries the vegetation. An example of this incredible spectacle was filmed by another BBC camera crew for their pioneering programme about nature in the former Soviet Union, Realms of the Russian Bear, shown in 1994. But much were to happen in the interim. The saiga was poached to near-extinction in the early 2000s for their horns and meat as the Soviet Union collapsed, and was listed as Critically Endangered on the IUCN Red List in 2001. However, by 2015, conservation work by governments, scientists and NGOs was paying dividends; overall numbers had risen from its nadir of an estimated 50,000 in the early 2000s to around 300,000 in early 2015. One central Kazakhstan population, in particular, was responsible for the vast majority of this increase – and this is where the Planet Earth II camera crew headed for their shots of the calving spectacle in 2015 but ended up seeing mass dying ! Later analysis revealed that the proximate cause of death was toxicity from infection by opportunistic bacteria found naturally in the animals’ respiratory tract – Pasteurella multocida. The next Q was why did these usually harmless bacteria become virulent? What was the environmental or internal trigger, either reducing the animals’ immunity to these bacteria or triggering virulence in the bacteria, or both? In exploring these questions, BBC research was a Russian doll; they went back to old field notes from the Institute of Zoology in Kazakhstan for 1988 when a similar mass mortality occurred; reviewed research on mass deaths in other species; looked for differences in the vegetation composition between the 2015 die-off and in other years; and built statistical models to explore changes in temperature and rainfall over a range of different temporal and spatial scales. Before the results could be out, there were wild theories including the involvement of aliens ! UFO Sightsing Daily, posted: "This Antelope mass death was an experiment by aliens. It is well known to the Kazakhstan Government that aliens are making use of an underwater base in the Caspian Sea which Kazakhstan boarders." Man could find reasons for the mass die-off, but when will they realize that their cruelty and greed is pushing Saiga and many other animals towards extinction !